How to make a dream catcher with your own hands from willow rods and leather lace? Home / Needlework / Why do you need a dream catcher and how to make it yourself? 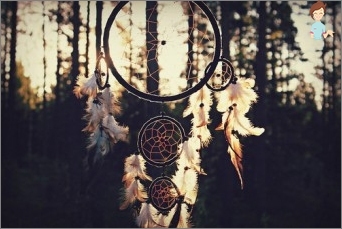 Why do we need a dream catcher and how to make it ourselves? What is a dream? Reality, accessible to a person in the subconscious or a parallel world, where access is only revealed to the sleeper? You've probably heard about the amulet of the dream catcher. This amulet is widespread in the culture of the Indians of North America and the peoples of the north. It protects the owner from bad dreams and nightmares. Usually a trap of dreams is suspended at the head of the bed, but you can and draw Amulet, and even make a tattoo. Today, the amulet guarding the sleeper can be bought in any souvenir shop, but, most likely, it will be just a beautiful decoration in the ethnic style. This talisman should be made withThe mental wishes of good to the one for whom it is meant. Therefore, if you really believe the magical power of the amulet, it is better to learn how to make a dream catcher yourself. The mascot of the Indians, asabikeshiinh, in the Ojibwe language means "spider". Amulet is a circle of willow rods. With weaving inside, reminiscent of cobwebs. 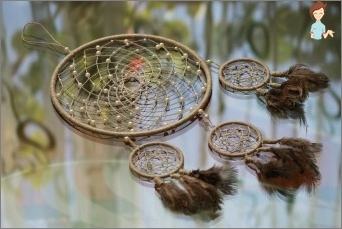 How to weave a real dream catcher? You can use a thread or a leather lace. Indian women wove them from reindeer veins. According to the legend of the Lakota people, the leader of the tribe wasTeacher of wisdom Iktomi in the image of the Spider. Talking with the leader, Teacher bent a ring from the willow branch, explaining that this ring from the willow rod symbolizes the life of a person. Prutik has a different thickness, being the embodiment of life from the birth of a child, to adulthood and aging. So Spider spoke to the leader, and wove his cobweb in the ring from the willow. Only in the middle of the circle was a hole left of the cobweb. A lot of roads open for a person. Some draw along the path of good, while others take the wrong path. A person is always free to choose his own path. But in the spiderweb there is a gate through whichGood thoughts will find the way to the mind and soul of a person. All the evil, terrible will be entangled in the intricacies of the threads of the web and will melt with the dawn. In order to clear the amulet from evil spirits accumulating on the cobwebs, it must be carried out in the sun. The hoop of the magical trap is an allegory of the pathThe sun in the sky. Eight points of contact of threads with a willow ring - a symbol of a touch of eight legs of a spider, associated with Indians from the Universe. The spider weaves an endless thread of events, and one day pulls a thread of the web and winds the whole world to its source, and begins to weave its cobweb again. An Indian amulet is a kind of model of the universe. People at all times were wary ofDreams. It is believed that during sleep the soul goes to travel. 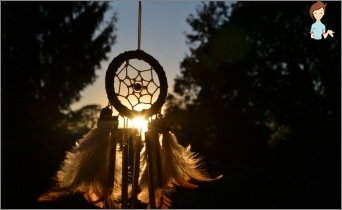 According to the beliefs of the Indians, the soul through dreams talks about their desires, and when it does not get what it wants, it starts to get angry. 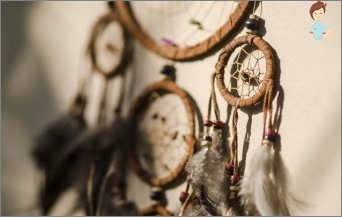 In the tribes of the Indians, dreams were taken very carefully, and Dream interpretation Was an important part of the public life of membersTribe. Dreams were considered the voice of ancestors and served as a support and a guide for real life. The amulet, which protects from bad visions and thoughts, is a tool through which they tried to control the subconscious and influence the real life. 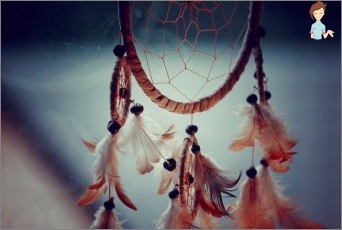 Why we need a dream catcher, we found out. And now let's make the talisman ourselves. To create the base - rings, it is better to use the willow rod. Now it remains to make a suspension and decorate the catcherIn the lower part of bird feathers. You can fasten the pen by wrapping the base with a thread. The attachment point can be hidden with a bead, the diameter of the hole which allows you to hide the awn. The choice of feathers for decoration is based on the one for whom the talisman is intended. For a gift for a man, feathers "Male"Birds - a falcon, a hawk, symbolizing strength and valor. To make an amulet for a woman, take the feathers of an owl, symbolizing female wisdom, or ptarmigan, ducks. Making an amulet, you need to fill it with good wishes to the person for whom the gift is intended. Now it remains to hang a trap at the head of the bed and see only good dreams, and Bad dreams And thoughts will linger in the web of the trapper. Do not forget to periodically take out the amulet in the sun, in order for the luminary to destroy all the bad things that have become entangled in the chains of the catcher. Does the painted catcher help the visions? We figured out how the dream catcher does his own thing. And does the trap for dreams help, if you draw it? Like all amulets, the trap for visions is not strong by its form or authenticity of materials. The main thing is the belief that the guard will protect you orYour loved ones from all the bad. That's why it's important to do it for yourself or as a gift. Therefore, if you put the same emotions into the drawing, as in the making of the catcher from the willow twine and thread, then its purpose will remain. How exactly will you draw the dream catcher. Depends on your ability to draw and on what the drawing is designed for. Suspension in the form of a dream trap can be an element of a tattoo, if you are not confused by the wearing of such symbols on the body. A picture of a dream trap can be used inScrapbooking, drawing a picture frame of the picture. Another application of the figure depicting a dream catcher is the interior. Draw a symbolic circle with cobwebs can be directly on the bedroom wall. The main thing - do not forget to sometimes illuminate the image with direct sun rays, for example, choosing a place for drawing on the wall, so that in the morning it is illuminated by the rays of the rising sun.